You can enjoy home grown onions for months after the growing season has finished with just a little extra time and effort. 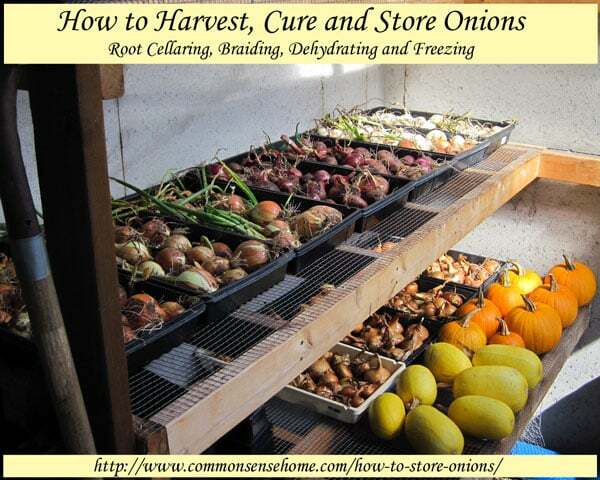 In this post we'll cover onion harvest, curing onions, and several different onion storage methods. Which Onions are Best for Storage? I usually grow onions from onion sets (the little mini onion bulbs). Out of the red, white and yellow varieties I've tried, the yellow Stuttgarter Riesen has been the best keeper. Stuttgarter Riesen is a large, deep golden-yellow onion with firm white flesh. The reds and whites I've tried have not kept as well, so I usually use them first. My friend, Tami, said that the onions she started from seed were much more solid and less prone to rotting than the ones that she started from sets. The Vegetable Gardener's Bible recommends Stockton Reds for storage. I've grown them, and they store fairly well, but the Stuttgarters store better. He also recommends the varieties Copra and Prince. Look for short-day or long-day onions, depending on your location. Short-day onions grow better in the south, because they require roughly equal amounts of light and darkness. Long-day onions are better suited for the north, because they require longer hours of sunlight to set bulbs. Northern growers should get their onions in as early as possible, because once the daylight house get shorter, your onions will only fill out the layers they've already formed. June planted onions = largely a waste of time. Another note: Make sure to buy good quality seeds or sets. 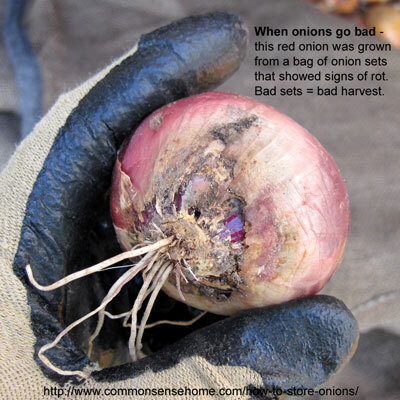 This spring, the red onion sets that were available locally were kind of scrubby looking – lots of rotten little bulbs in the baggie. I bought some anyway, because we do like red onions. This fall, when I started digging, many of the red onions were in bad condition with rotten outer layers. None of the other onion patches had the same issue. No more questionable onion sets in my garden. They are not worth the effort. Onions can be harvested for fresh use at any time during the growing season, from small green onions early in the season to full size mature onions. My friend Julie's mom purposely plants her onion seedlings very thick so that she can thin them out and eat lots of small green onions fresh out of the garden. To harvest onions, simply loosen the soil, if needed, with a hand spade or fork, taking care not to skewer the onion or break off too many the hairlike roots if you want to store the onion intact. Brush off loose dirt. To prep for storage, please keep reading, otherwise clean well and use any way you like. 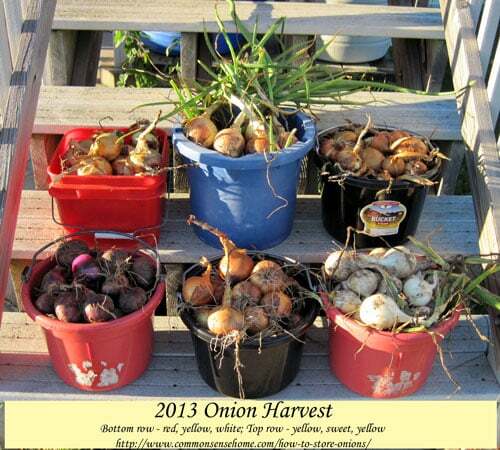 Storage onions should be harvested at the end of the season, when full growth has been reached. This can be when the tops start flopping over, or you can do it like I do and harvest when frost threatens in fall. Here in northeast Wisconsin, I've found that they usually keep just as good or better in the garden than inside, as long as it's not a wet year. If the soil is wet, they may start rotting, so pay attention and watch for any trouble. I'm usually busy earlier in the growing season scrambling to harvest and preserve everything else that needs preserving, so onions are one of the last crops to come in. Waiting to harvest usually means that there's not much left to the tops of the onions, so braiding is not an option. If you want to try making an onion braid, pull them up while the tops are still intact. When the onions are pulled from the soil, the outer skin is often tender and moist. This can lead to mildew and rot in storage. To prepare onions for storage, they should be cured. Curing is simply the process of drying the outer layers of the onion, to make them more durable and less likely to rot or mildew. If the weather is good, you could pull them and leave them in them spread in the garden to dry for up to a week. Don't wash them, just brush off the dirt. My preference is to place them in a shed, garage, covered porch or other well-ventilated area (I use our greenhouse), spread out on a flat surface out of direct sunlight. As I mentioned, I spread ours in our greenhouse, and cover them with a sheet of burlap to keep the sun off. 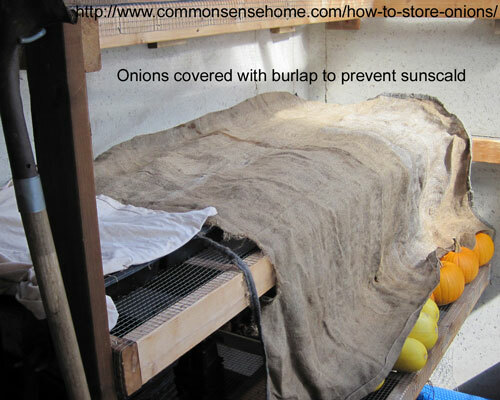 They will smell strongly of onions, so good ventilation is key not just for drying, but for venting the fumes. Once they are completely dry, you can wipe off any dirt and really loose outer layers of skin (leave some skin on for protection and to keep the onions from drying out too much). Trim tops to about one inch above the bulb, or leave intact for braising (see below). There are a number of ways to store your onions once they are cured. These are optimal, but onions are fairly forgiving. Don’t store onions in a sealed bag or container. Avoid high temperatures, direct sunlight or high humidity. They cause the onions to shrivel and/or sprout early. Don’t store them directly with apples or potatoes, if you store them in the same root cellar you MUST have good ventilation. What to store Onions In? I keep mine in open bins in the root cellar. That way I can easily spot if any start to go bad or sprout and use them first. You could use mesh baskets, wooden crates from clementines, planting trays, bushel baskets – whatever you have available. Don't stick them in a plastic tub with a lid and no airflow. A classic onion storage method that I have never tried, as I rarely wear pantyhose and I used my old ones to tie up tomatoes. Maye C. shared her technique on the Common Sense Home Facebook page. Collect lots of used pantyhose. Any full length size. Ask at church or friends. Drop an onion in tie a knot, add another tie a knot, add another ect. ect. ect. until both legs are full. Take to storage area hang over a nail at the crotch. Then they will have good air circulation. Repeat with more hose until done. To use, start at the toe and cut below the knot and remove the onion. Just remember to remove onions off of each leg, so it will keep hanging even on the nail. My mother taught me this over 40 + years ago. This really saves on space. And you can keep track of usage at a glance. Also on quality if one starts to go bad you can remove it and use it quick. If you have intact tops, you can braid your onions together with a piece of twine. You want to do this before the tops are completely dry, so they they are a little more flexible. This video demonstrates how. Use the oldest onions first. Check the onions for soft spots or discoloration. If you want to let onion go to seed, save the best, large, perfect onions to be planted in the spring and harvest the seed in the fall. We generally purchase seed or onion sets rather than trying to let them go to seed. Onions are about 88% water, so you should allow a day or two in a heated dehydrator at 130 to 140 degrees F. My Excalibur recommends a temp of 125 for veggies, the American Harvest recommends 135. Using an non-electric dryer will likely take longer. To prepare onions for dehydrating, peel and slice or chop into pieces of uniform thickness. No pretreatment is necessary before drying. Thinner pieces will dry more quickly. Slice into rings, separate and spread on your drying trays. Alternatively, you may cut into chunks – your choice. Think about how you are likely to use the onions after drying. A friend shared some chopped dried onions with me a couple of years ago, and they were quite handy to toss into soups and stews. Dry onions until leathery/brittle. You may want to dehydrate in a garage or out of the way location, as the smell from the drying onions will be strong. Simply pulverize your dried onions in a blender or food processor. You probably only want to make some batches of powder at one time, as it will clump because it contains no anti-caking agents. Store in an airtight container – my preferred option is vacuum sealed mason jars for longer storage. If you want to make sure your onions (or other dried foods) are dry enough, you can get this nifty gadget called a Hygrolid hygrometer, which fits a hygrometer to check relative humidity to a wide mouth mason jar. The Ball Blue Book recommends blanching your cleaned bulbs for 3 to 7 minutes until the centers are heated, then cooling and draining and packing into can-or-freeze jars (wide mouth) or plastic freezer boxes. My brother had problems with spoilage one year due to a wet season, so he simply chopped his onions and packed them in freezer baggies in amounts that would be suitable for a single meal. He then packed the smaller bags into one larger bag, to keep them from getting lost in the freezer and contain the odor. (Fresh onion smell will leach through a single layer of plastic, and may give other items an “off” taste. I've chopped and sauteed a mess of onions, spread them on a sheet pan to freeze, and then loose packed them or vacuum sealed them in a baggie, so I can pour out only how much I need at one time. Pre-cooking drops the odor dramatically. This saves times later when cooking, too, as many of my recipes start with “x” amount of sauteed onions. Cooking before freezing knocks out the natural enzyme activity in the onions, which even in the freezer will break them down over time. If you're going to use them fairly quickly, it's not much of an issue. I hope you've enjoyed this post and are encouraged to grow some onions for storage, or pick some up at the local farmer's market. Don't forget to Share or Pin for later. 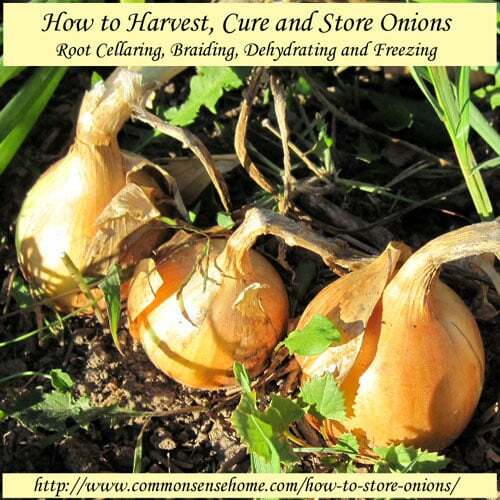 I have been freezing onions for a long time, but I did not know how to prepare for a root cellar or the temperature. Thank you for the help. Thanks for taking the time to comment, ladies. thanks for the info! question on the hygrolid – do you use that just to check the humidity in the jar, and then use whatever lid you’d normally use? i’m guessing (hoping, as they aren’t cheap) that it’s meant to be used like an instant read thermometer is for the oven. It’s not instant read – they recommend keeping it in a jar for 48 hours to make sure the moisture levels have evened out to get an accurate reading – but you do use it to check and then seal with your standard lid. Thank you for all this great info! I grew onions once, but did not have great results, so I will definitely have to try again next year! Love your root cellar! Onions have been one of my most successful crops while learning how to garden up North and I got a number of great ideas and insights from reading this article. Where I am it can be very wet fairly late into spring, so planting is often delayed until the annual flood subsides and the raised beds in the high spots are accessible again. My first onion bed (started from bulbs) was just starting to fatten up when we had our first hard frost. Not knowing a thing about how to mulch onions, and thinking straw would crush the leaves, I stood flattened cardboard boxes around the sides, leaning them against the leaves, then laying flattened boxes over the top. I then overlapped 3″ thick layers of straw around the sides and over the top. This is one tough vegetable! In the spring I pulled everything off and found that the yellow ones had survived best and had grown a little over the winter. I let them grow for a second season. A few went to seed. I didn’t have a place to start the seeds the next winter, but would like to try growing from seed when space permits. The next summer, I planted a good number of onion bulbs around my squash. The squash did well but the onions were too shaded out to grow well. I actually forgot about them until the following spring, when I found them under a much more casual mulch of maple leaves. They survived -35F just fine, grew even fatter and were ready to pull much earlier than those in the previous experiment. The bed where I had the squash was wetter than the first bed I tried. I have read comments about onions being a “marsh vegetable”. If my garden wasn’t so difficult to weed and bed up in spring, I might try just planting in fall this year. Regarding funky bags of bulbs, have you checked with your local feed store? Ours stocks bins of onions from which we pick out healthy bulbs. The selection is not real fancy, but these onions tend not to rot so readily. I have also heard about varieties of perennial onions that give you green onions over the winter and modest sized bulbs in fall, though you leave a generous number to continue growing growing over the winter. Rhizome grass is a persistent marauder in my garden area, not sure how the onions would fare with the relentless encroachment of the grass under the snow. You sound like a messy gardener after my own heart – try stuff out and see what works. I’ve picked spinach and mache that self-seeded out of a snow pile in the middle of winter. This is why my garden is rarely clear or tilled at the end of the season – things are still growing! We are running behind, but the boys and I still need to get a variety of tough crops planted in the new greenhouse. So far there are just a few things we moved inside from the regular garden. We live in Northern Wisconsin just west of Tomahawk. We’ve had a very wet season and pass result the onions are very muddy. My husband feels mud should be washed off before drying and I think the mud dry before drying. We have a good crop and want to have then all winter long. Which is better. I’d probably air dry and they brush off the mud. Whether you’re rinsing or dipping, there’s more chance for the water and mud to work under more layers of skin.